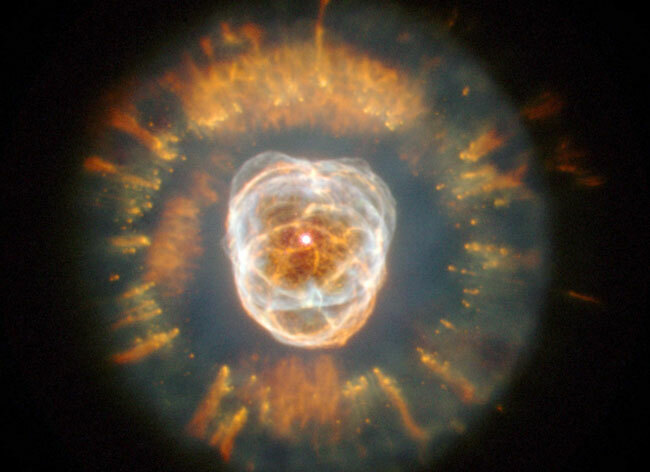 Explanation: In 1787, astronomer William Herschel discovered the Eskimo Nebula. From the ground, NGC 2392 resembles a person's head surrounded by a parka hood. In 2000, the Hubble Space Telescope imaged the Eskimo Nebula. From space, the nebula displays gas clouds so complex they are not fully understood. The Eskimo Nebula is clearly a planetary nebula, and the gas seen above composed the outer layers of a Sun-like star only 10,000 years ago. The inner filaments visible above are being ejected by strong wind of particles from the central star. The outer disk contains unusual light-year long orange filaments.